A psychological thriller in which Charlie, a wealthy banker with an uneasy conscience, invites his troubled cousin Matthew to visit him and his wife in their idyllic mountaintop house. As the days grow hotter, the friendship between the three begins to reveal its fault lines. ...exceptionally entertaining ... There’s something reptilian in Lasdun’s gaze, a coldblooded interest in furtiveness, in the lithe selfishness of the genteel. 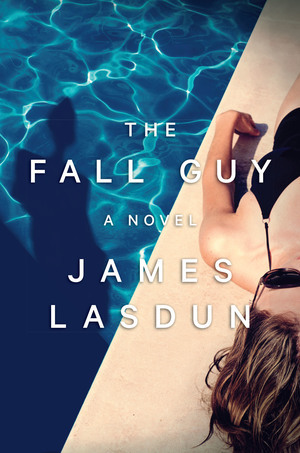 The Fall Guy reads like early Ian McEwan or late Patricia Highsmith ... Lasdun is masterly in his story’s construction. His clues never seem like clues until they bind tightly around one of the three leads. This is exactly what a literary thriller should be: intelligent, careful, swift, unsettling. Its author deserves to find more readers on these shores. ...a twisty, chilly, exquisitely written, and tautly suspenseful exploration of big ideas in the guise of a psychological thriller ... no one — neither callow one-percenters nor those who protest their excesses — is immune from Lasdun’s witheringly satiric gaze ... Lasdun’s prose is both lapidary and hypnotic. ...engaging, effortlessly readable literary thriller ... This delight to read is also a fine study in the classic unreliable narrator. Only towards the end are other characters allowed to hold mirrors up to Matthew and reflect very different visions from the one Matthew presents to the reader ... Lasdun’s writing style is clean and straightforward. All the complexity resides in character and detail. This is masterfully controlled 2am noir. Who knows what’s up with the option, but me, I’d film this one in black and white. What did you think of The Fall Guy?